« Have we learned anything in the last 4 decades when it comes to allowing chemicals like PCBs onto the market? Dot size: Number of service connections in a community water system (range). Dot color (purple shades): Percentage of service connections with a lead portion (range). 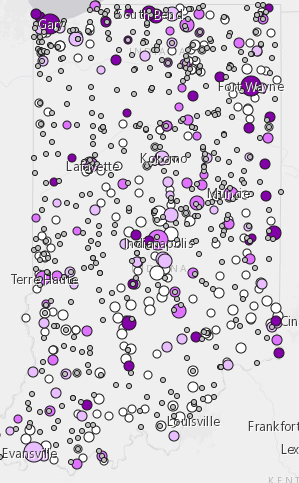 Dot color (grey): Those community water systems that either did not respond to the voluntary survey at all or that did not respond to the questions on LSLs. What does the map not show? Legal citation or ordinances that establishes the ownership of the service lines. The best way to map LSL information is likely to change from state to state, depending both on the survey instrument utilized to acquire the data and the types of responses received. We don’t suggest that we have figured it all out. We provide this map simply as an example for consideration and encourage states to explore this and other options. Click here to check out the map and explore the data. This entry was posted in Drinking Water, lead, Public Health, States and tagged Indiana, lead, Lead Service Line, lead service line inventory. Bookmark the permalink. Both comments and trackbacks are currently closed.